Mr. and Mrs. Easter Bunny will begin meet and greets this Sunday at the Magic Kingdom. You can find them in the Town Square Courtyard on Main Street U.S.A. April 13-19, from 9:00 AM to approximately 5:00 PM. 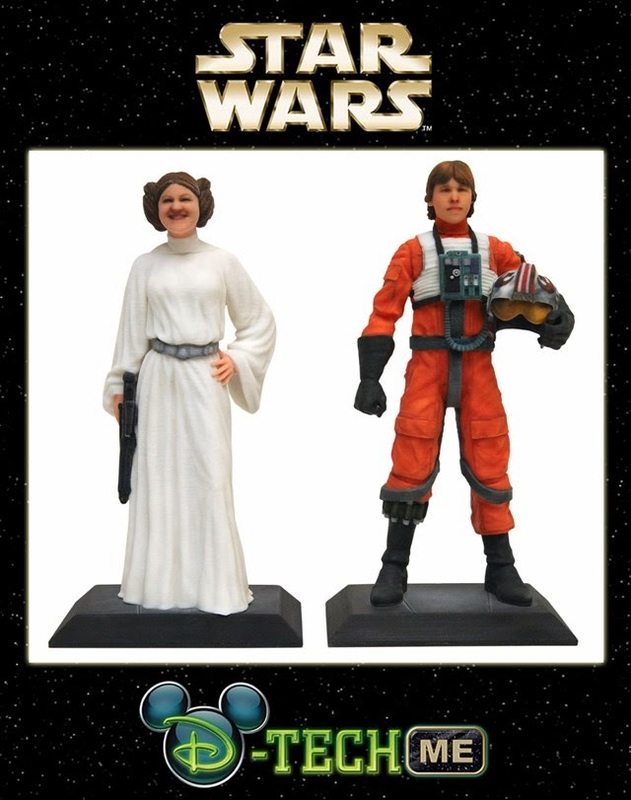 D-Tech Me returns once again to Star Wars Weekends - giving you the chance to have your likeness on a Star Wars figurine. The Carbon-Freeze Me and Stormtrooper will be available again, but will also be joined by new options - Alderaan Princess and X-Wing Pilot. Also new this year will be a 16 inch tall version along with the regular 7 inch. The 7 inch figures are $99, and the 16 inch figures are a whopping $1499.95 plus shipping and tax. The process begins with a scan of your face, which takes around 10 minutes. From there, the figures are produced on a 3D printer, with delivery 7-8 weeks later. To book your experience, call 407-WDW-TECH (407-939-8324). D-Tech Me is only available during Star Wars Weekends 2014 (May 16 – 18, May 23 – 25, May 30 – June 1, June 6 – 8, and June 13-15). Buena Vista Drive, the road that runs along side Downtown Disney will be greatly expanded as part of the Disney Springs redevelopment of Downtown Disney. To handle the increased amount of traffic in the area, the road will be expanded to 10 lanes and will be equipped with a dedicated bus lane. Two pedestrian bridges will also be built, allowing easy crossing of Buena Vista Drive. Although not yet confirmed to be built, there are also plans to add a new entry directly from I-4. The roadwork enhancements will be done in phases, with staggered openings leading up to a completion in Spring 2016. You can now take part in a Muppet scavenger hunt in Epcot's World Showcase. In celebration of the new 'Muppets Most Wanted' movie, guests will travel around World Showcase looking for Muppet treasures.You can pick up a clue packet in World Showcase Plaza, with the hunt taking place in the United Kingdom, France, Italy and Germany pavilions.